BDS Suspension has built a reputation of top quality suspension lift kits for the 2007 and up Toyota Tundra. The current lineup of 3", 4.5" and 7" lift options not only improve the appearance and tire clearance, but also the ground clearance and all-terrain performance. The newest addition to this lineup is the 4.5" high clearance performance coilover system bringing a new level of performance to the 4.5" lift height. Whether you're cruising the highway, climbing trails or bombing through the desert, this kit is built to handle the adventure by correcting the suspension geometry, adding protection and improved dampening capabilities. This new option is available as a 4.5" complete system as well as an upgrade for current BDS 4.5" equipped trucks. Get the look and performance you're after with clearance for 35" tires from BDS and FOX. 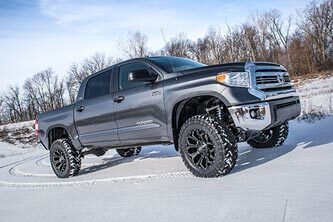 4.5" Performance Coilover System: BDS Suspension adds to their sterling lineup of high quality suspension lift kits for the Toyota Tundra with new 4.5" performance coilover systems designed for vastly improved offroad performance while providing a smooth, comfortable ride on pavement. 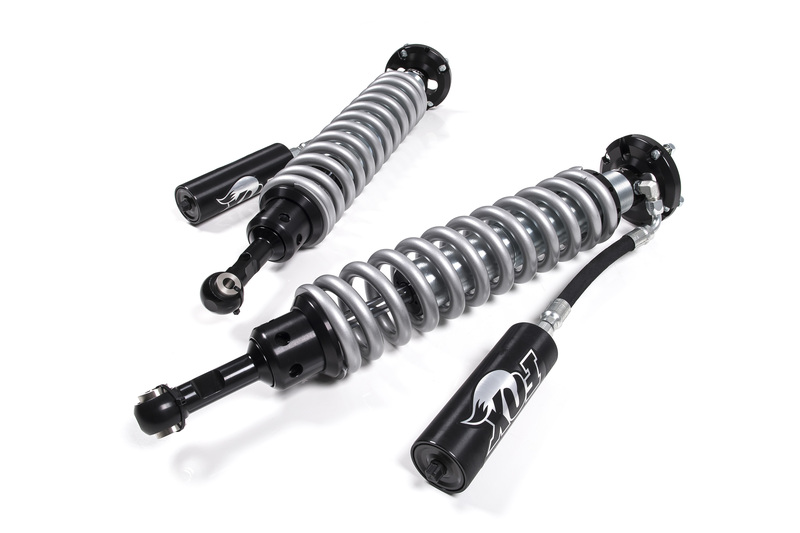 These new coilover systems build on the proven high clearance design of the 4.5" and 7" BDS suspension systems, now offered with FOX 2.5 remote coilovers pre-tuned for optimal performance right out of the box. These new 4.5" systems integrate flawlessly with the new electronic stability control (ESC) systems and allow enough clearance for 35" tires to be installed. For 2007-2016 Tundra owners already running the BDS 4.5" high clearance kit the FOX 2.5 remote coilovers are available as a upgrade to improve performance. 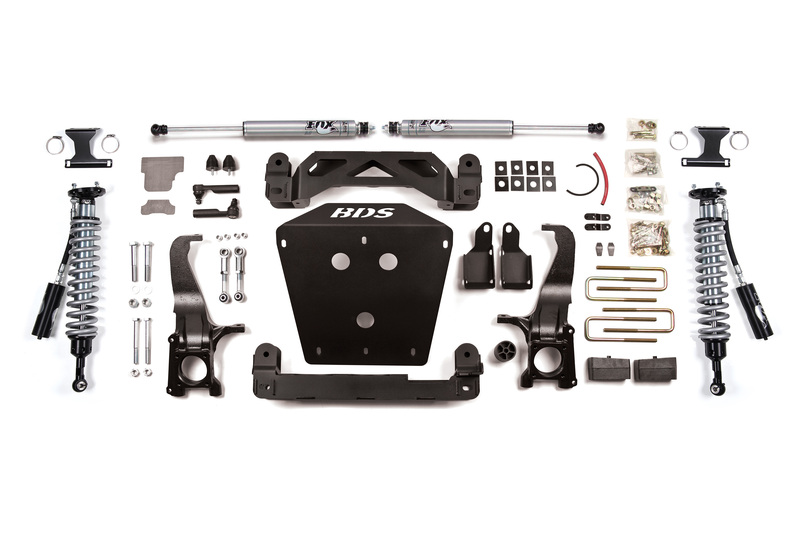 The coilovers come pretuned and include all the mounting hardware to bolt right into place of the strut/strut extension assembly with a frame mounted bracket for the external reservoir. 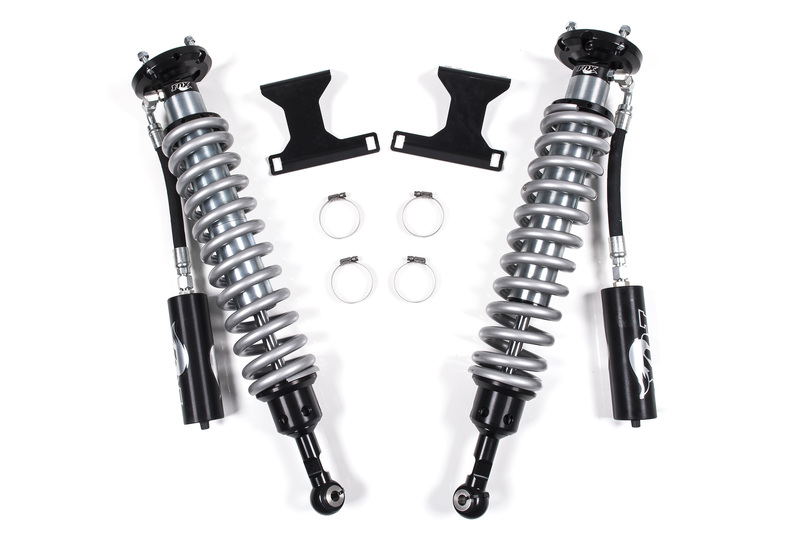 Easy bolt-on installation, coil spring preload set for proper ride height out. 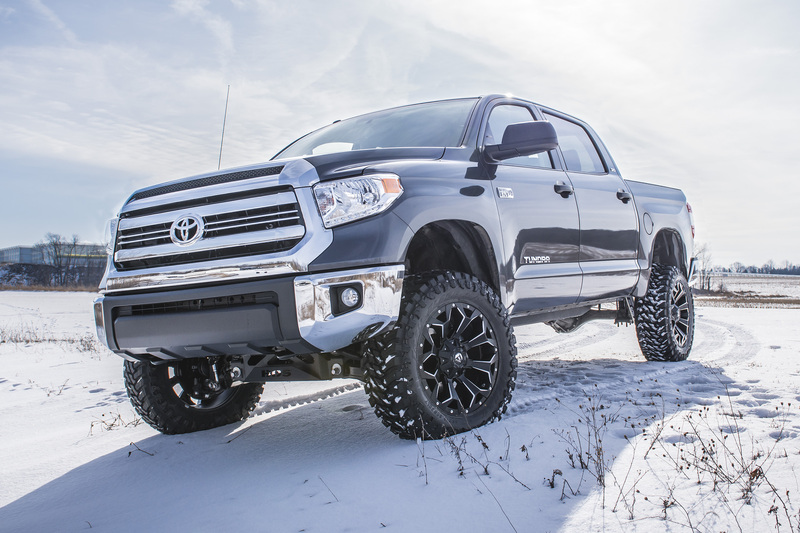 Get more out of your 2007-2016 Toyota Tundra from BDS Suspension and Fox with new 4.5" Performance Coilover Systems. Hey I’m from Canada and interested in this fox 4.5″ lift kit for my 2016 tundra platinum.. I’m just wondering if you ship to Canada? Or you you have disturbuters in Canada that you recommend.. thanks and looking forward to your reply.. I just purchased this 4.5 lift kit! out of curiosity what are the parts i need to order if i wanted to upgrade the height to resemble the 7 inch coiler system? You’ve got it, the rest of the suspension is the same and can accommodate the 4.5-7″ lift height. I have the 7″ lift on my 2014 tundra and im getting squeeks up front i assume is from the coilover shocks when I’m going over bumps in the road. What do you think it may be and what can i do to fix it? Please help it is becoming very annoying. Hey Josh, contact our customer service team so they can assist you to make sure you’re getting the correct parts, (517) 279-2135 or sales-bds@sporttruckusaincinc.com. 2007 Toyota Tundra 2wd double cap. 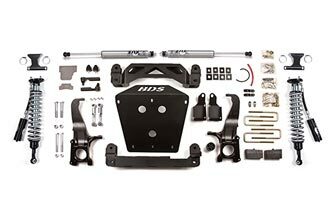 I have the ICON 2.5 remote reservoir coilover series front and rear I wonder is this kit will compatible what I have. The shocks that I have are only allow 3.5 lift for maximum. Does the 4.5″ kit require cutting off the cross member? As is common with most IFS lift kits our 4.5″ and 7″ lifts for the Tundra require cutting/removing the factory rear crossmember. This is required to allow the front driveshaft to be reconnected to the front differential after beign repositioned with the lift (which is required to keep the CV axles at an acceptable operating angle). You can check out the step-by-step process to do it in steps 27-30 of the instructions at http://bds-suspension.com/instructions/028702.pdf. If cut cleanly it can be welding back in place to return the truck to stock if you ever chose to do so. Hey Luis, typically this setup levels out the stance and in some cases a slightly tail high setup. Assuming the coilovers haven’t been adjusted taller for more tire clearance I’ll say its possible to be tail low, not all truck are exactly the same and heavy accessories like camper shell, aftermarket bumpers, other gear loaded in the bed can all effect final ride height. If your everyday usage ride height is 1″ tail low you have a couple options to bring the rear stance up. In either case, you local BDS dealer will be able to assist you with the purchase and installation to get the ride height set.